Chevrolet will offer a throwback aftermarket V8 engine with modernized components that delivers up to 420 horsepower. The automaker displayed the engine, called the ZZ6 EFI, under the hood of a classic 1967 Chevrolet C/10 pickup truck at the 2018 SEMA Show on Tuesday in Las Vegas. The ZZ6 EFI is the newest member of Chevrolet’s storied line of small block V8 engines. The engines are known for their versatility and easily fit into a wide range of vehicles to improve performance. They are particularly popular with custom hot rods and modern restorations of classic vehicles, or resto-mods. Updated components such as electronically controlled fuel injection help the ZZ6 EFI develop efficient power. Yet the engine maintains the compact size and classic design that have long drawn modifiers to small block Chevys. Chevrolet did not reveal pricing for the ZZ6 EFI. So-called “crate engines” are popular with enthusiasts because they come fully assembled and ready to install in a variety of vehicles. Chevrolet brought 30 crate engines to Las Vegas for the convention, which focuses on the newest automotive accessories and trends. The manufacturer chose the SEMA Show to unveil the ZZ6 EFI because the event is popular with vehicle modifiers. The show features thousands of customized cars and trucks from vehicle manufacturers and aftermarket companies. More than one-fifth of all vehicles displayed at the show are trucks and SUVs, according to a recent SEMA report. Pickup truck owners are also more likely to buy aftermarket parts and accessories, compared with owners of other types of vehicles. 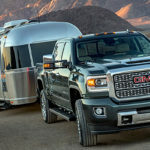 Upgrades for pickup trucks account for 29 percent of total vehicle-accessory sales, the highest share in the industry. Naturally, the C/10 pickup powered by the ZZ6 EFI sported heavy modifications including a lowered suspension, 20-inch wheels and custom bumpers. Chevrolet also showed a restored 1978 K10 Silverado pickup powered by its existing L96 big block V8 crate engine. The L96 engine is a small block.